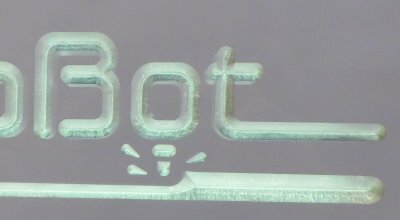 « Handibot Smart Tool now available at Handibot.com! What can you teach from making a sign? Bill Young brought in this sign, made from acrylic that has been V-Carved, plywood that has been pocketed and cut out, and a peg that was 3D printed. 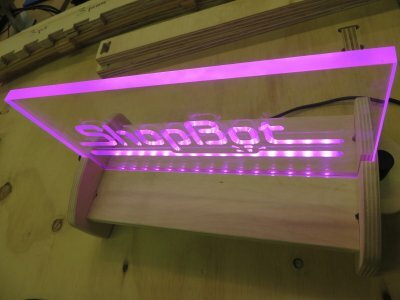 At the bottom of the sign is a strip of LEDs, their changing colors programmed with an Arduino. While it is a simple enough project, it contains a wealth of lesson plans. To get the Design in to the Computer for machining or “Printing”, one would start with Computer-Aided-Design (CAD) software. Computer-Aided-Design (CAD) software is available in all ranges of complexity, from 2D graphic software like Inkscape, Adobe Illustrator or Corel Draw, to engineering software to create parts, assemblies and render 3D images on the screen such as SketchUp, 123D, SolidWorks or Inventor. The cost of the software also ranges from free to not so very free. Computer-Aided-Machining (CAM) is where you give the computer instructions on how you want to “print” the Design. 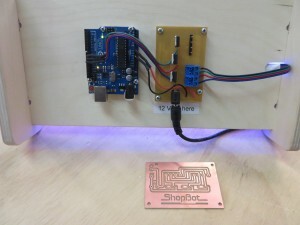 With CNC subtractive machines like ShopBot, you include instructions on how you want the parts cut out or engraved, what kind of router bit you are using, and what speed (feed rate) you want to the router to move through the material. Instructions to other digital fabrication tools may be less obvious in applications like Desktop publishing (are you printing in black and white or color? are you printing on regular or photo paper?) or laser cutting (what feed rate and power setting do you want to use for that material? ), but you are still making decisions on how you want you want to “print” the design. ShopBot ships with their tools a CAD/CAM software called VCarve Pro, ShopBot Edition, created by Vectric. You can visit the website and download a trial version of their many wonderful CAD/CAM softwares. Tutorials are also available on the website. The image below shows a sample of the Design and Machining Options available with VCarve Pro, and a simulation of the result. 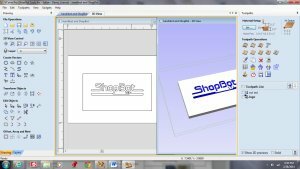 You can use any number of softwares to Design and Create toolpaths for ShopBot and other digital fabrication tools. 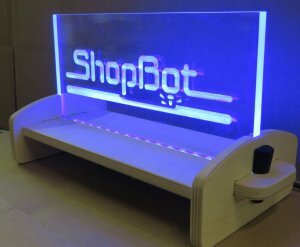 The ShopBot Logo is a registered trademark. Do we have permission to use it? Why is the light not visible as it travels through the acrylic yet shows up at the ends and carved locations? Confession: The Acrylic was carved from the front, so the roughness of the cut is visible. 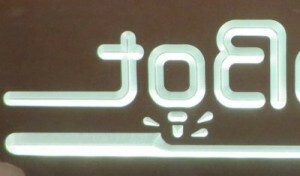 If you turn the sign around and view it so that the V-Carving is on the back side, the lettering is much cleaner and clearer. Running a test cut in a test piece of acrylic or prototyping the sign would reduce the need to re-do the sign to deliver a product that meets the quality that a customer expects. How can school address needs of local community/business? Who are the companies providing the services/products?